Where Can I See Myself With Different Hair Colors? 2 Where Can I See Myself With Different Hair Colors? Do you ever go to the salon with a photo of the PERFECT cut and color, only to discover that it doesn't look quite so perfect on you? It's disappointing, isn't it? At times, it can even be embarrassing. Most women take pride in their appearance, and having an unflattering haircut can destroy their self confidence. We can try perfume and lipstick before we buy it at Sephora, Clinique, or Urban Decay. We can make sure that the jeans at Macy's have a flattering fit before we purchase them (and if they don't, we can return them). Unfortunately, we don't really know how a new cut and color will look on us until we leave the salon. Virtual makeovers, which allow you to upload a photo to test drive hair and makeup trends, are growing in popularity. Sounds good, right? The problem is that they aren't all free; some of them even require you to download software to your computer- and who wants to do that? Save your memory card for important things, like all of the movies and songs you won't be illegally downloading. Because you have morals and ethics, right? Thought so. Are you ready to get a totally free (no hidden costs, no secret software) virtual makeover? Allow me to help! Take a clear photo of your face. If you have long hair, put it in a ponytail. If you have bangs, clip them away from your face. The photo should show your face, and only your face (and maybe a little of your neck and shoulders). Apply your makeup as you normally would (unless you're interested in applying virtual lip gloss and mascara, which is also an option). If you forget to put your hair back for the photo, you'll probably still be able to try out the hairstyles for long hair. I know this from experience. Are you familiar with Marie Claire? It's a pretty awesome magazine that is geared towards women who care about fashion just as much as they care about global issues. I've been a subscriber for years. Anyway, Marie Claire has a website, which is www.marieclaire.com (the clickable link be found at the end of this article). Before you can receive a free virtual makeover, you have to register with Marie Claire online. You can do this by clicking on "Join Free", which will be located in the upper right hand corner of the page. After you are officially registered with Marie Claire, you can give yourself as many virtual makeovers as you want! From the main screen, click on "Hair & Beauty", followed by "Virtual Hair Salon". Click on "Start Your Makeover". You will be prompted to upload your photo. Follow the instructions, and you'll be giving yourself a virtual makeover in just a few minutes! You can have long hair, short hair, curly hair, wavy hair, bangs...you name it! Change the color, and add highlights or lowlights. You can also apply lip gloss, lipstick, eye shadow, and mascara. This can provide hours of entertainment, especially if you have a boring office job. Save your favorite looks, and email them to your friends (or yourself)! Make sure to print out a few copies of your favorite cuts and colors; next time you visit your stylist, you'll be prepared! Bad hair? That's something that happens to other people, not you! Smile in your photo. You'll look even prettier that way. Don't forget to pull your hair back for your picture! 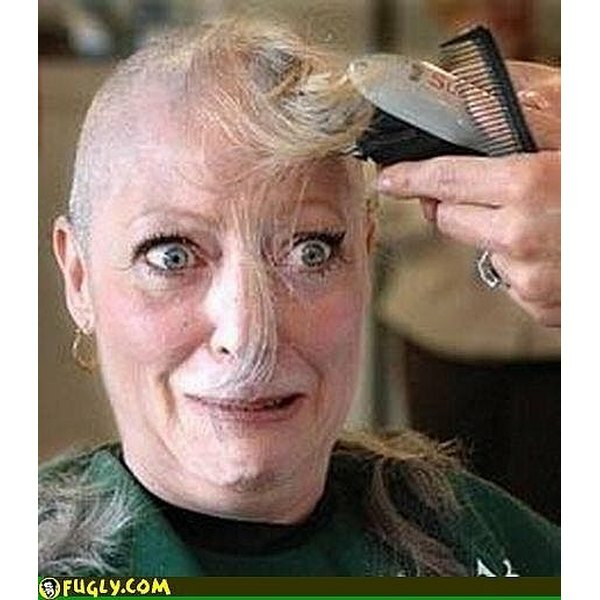 Some people might make rude comments about the cut and color that you choose for your virtual makeover. Ignore them. They're probably just jealous of how hot you are.